People often think that Monochrome Cards are just black and white, but here are some using colour. Using black and white can produce some dramatic results, and can be for various occasions. 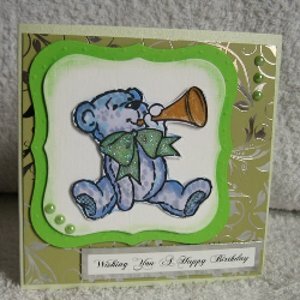 So there is nothing to stop you using colour to make some cards with a one colour theme. The colour that you use can be any that suits your recipient, and the patterns can be flowers, spots, stripes, paisley...anything that you have in your Paper Stock. 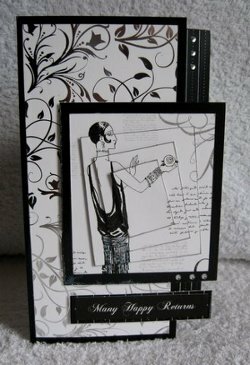 But here I have tried to keep all the patterns and tones blending, complimenting each other for a soft and gentle card. 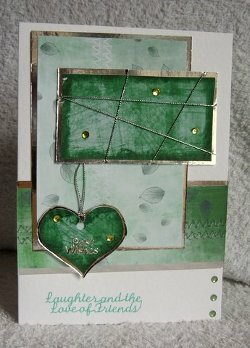 ...and green is used again for the panels in this card. They are layered onto silver for effect but the overall colour is just shades and tones of green. 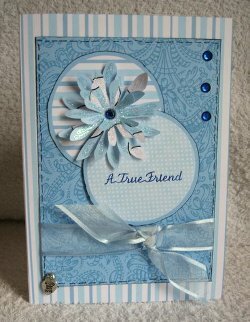 Gemstones and Peel offs are used to add decoration to the finished card. It will help you to put contrasting schemes together for some stunning results.